I love Indian food, but my husband isn’t a fan of curry. 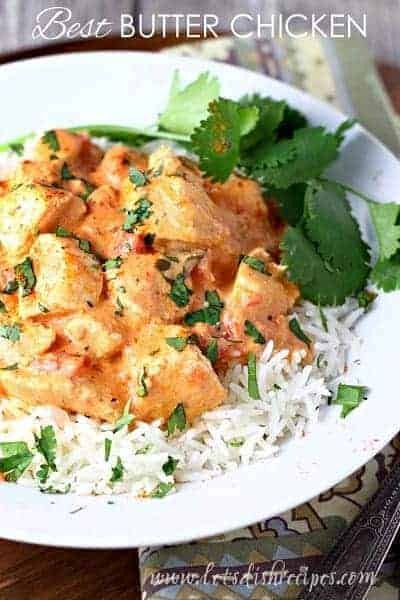 This Best Butter Chicken is a great compromise for us. 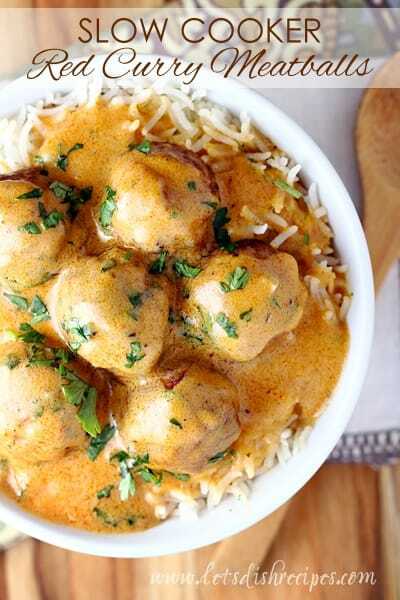 It’s got an Indian flare without a strong curry flavor. My kids love this too! And we all agree, the creamy, tomato based sauce is lick-your-plate good. I have been know to eat it like soup, with a spoon. To be honest, I’m not sure where the name Butter Chicken comes from, since the sauce is more of a tomato sauce than a butter sauce. There is still quite a bit of butter in it though…..and when something is this delicious, I’m not going to worry too much about what we call it. I like to serve this over jasmine or basmati rice, but brown rice or plain white rice work just as well. And don’t worry when you see all that cayenne pepper in the recipe. It’s really not that spicy. This is such an easy recipe too! Just make sure you remember to leave time to marinated your chicken. 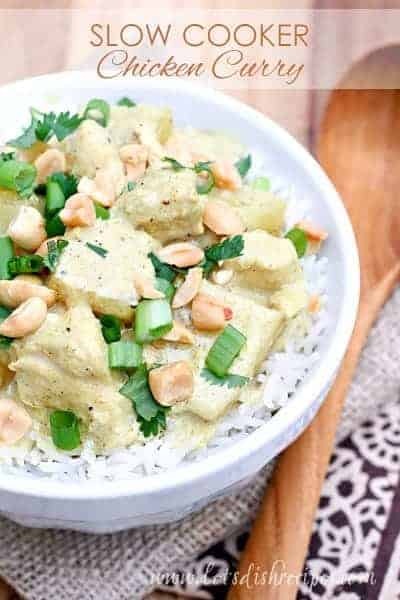 Just between you and me, sometimes, I forget to marinade the chicken and this dish still turns out delicious! I try a lot of new recipes, so I rarely make anything twice in a month. I’ve made this twice in two weeks. It’s that good! 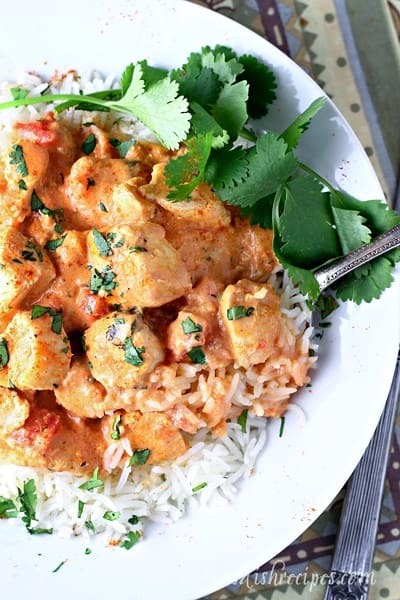 In fact my boys (who also happen to like curry) often request this butter chicken for dinner. I’ve already recommended it to several friends, who loved it as much as we did. I’m pretty sure it’s destined to become an all-time family favorite. 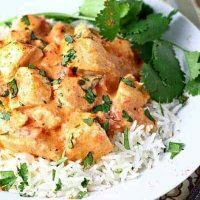 Be sure to save this recipe for the Best Butter Chicken to your favorite Pinterest board for later. Tender pieces of chicken, marinated then cooked in a creamy tomato based sauce with Indian spices. Combine the garlic, salt, pepper, spices and lime juice. 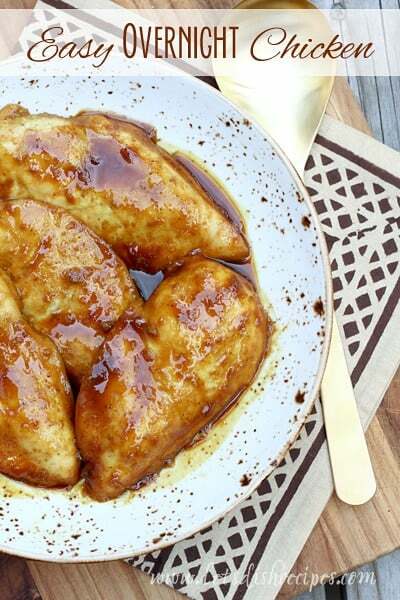 Pour over chicken in a shallow container or Ziploc bag and marinate for at least two hours. Saute the onion in the butter until soft. Add marinated chicken and cook about 10 minutes. Add the tomato sauce and diced tomatoes. Cook for 30 minutes over medium-low heat with the lid on. Add the cream and cilantro and simmer for an additional 5 minutes, until sauce is thickened slightly. Serve over rice. Who Dished It Up First: Adapted from Candy Girl. @Allison – this tastes nothing like curry! @Danelle – this is too funny – I feel like I’ve come full circle. I found your blog via Tasty Kitchen (I think), and now my recipe has appeared here via another blog. I never imagined when I posted this on TK it would get so much attention, but mmmm mmmm it is one of the yummiest things ever. PS- I highly recommend basmati rice!! Yum! This looks and sounds really good and I concur with your husband about the curry. Oh YUM! I’ll be making this SOON! Looks fab! Love a really good Butter Chicken. Yours look delicious. I LOVE IT!!!! LOVE LOVE LOVE IT!!! I finally found ground cardamom. But at $18 for 1.75 oz. I decided to play with some of the substitutes. I put in a tiny bit of ginger, a little bit of curry, and a touch of gloves (all together equal to about 1/4 tsp). It was good. All of my kids ate it, which is HUGE at our house. Another thing I loved is that it made a lot. I typically have to 1.5 or 2 times all recipes to feed our motley crew but we had plenty with some left over for me to have today for lunch. This will go into the favorites file! OH EM GEE! This is just…beyond words – awesome. As soon as you add the chicken to the onions it smells divine. Only thing I did different was to put mine over couscous instead of rice. This will be a regular around here. This looks awesome. I’m trying to shed some pounds. In your professional opinion, do you think it would really screw up the flavors if I substituted the heavy cream for plain greek yogurt? Maybe I could water it down to give it a similar consistency? I tried this with plain greek yogurt and it worked great! My family didn’t taste the difference. 🙂 This is one of our favorite recipes from here. What did you do with the marinade? You can discard it, or just throw it all in the pot with the chicken to cook. Since you’re cooking it, it’s fine to use the marinade in the final product. I cook the chicken in it, since it has a lot of the seasoning in it.